A traditional photo and a 360 presentation are not enough? 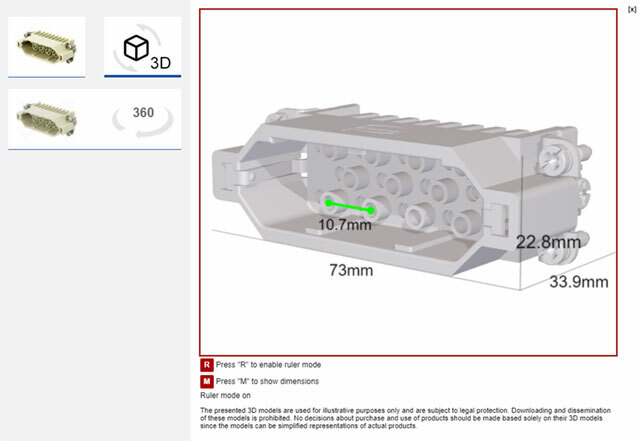 Some of the products in our catalogue can be viewed in three dimensions now! The presentation of 3D models makes it possible to zoom in, zoom out, or rotate models of products in order to see their structure in detail. It also allows for free preview of dimensions of the given product directly on the 3D model and easy measurement of the distance between two arbitrarily selected points. The 3D models that we publish come directly from the manufacturers and we do not make any modifications to them. They can be simplified, yet the most important features of the product are maintained. At the same time, please note that the models are intended for viewing only and cannot be made available for download. See a sample 3D model in the TME catalogue!